Susanne and I participated in an adult spelling bee tonight at a local brewpub. I have middle school PTSD resulting from my spelling bee experiences in 5th-8th grades. I won’t go into it, but I went to the state bee three of those years, pretty much because it pleased my mother. My anxiety was through the roof. It brought me distress and bullying at school, and I despised it. Mom said that she never knew that I hated it, but I am a spelling wiz because of it. So is Susanne, and she made it to the fourth round when she messed up on a word that she knew. (It happens!) The only reason I made it past the second round was because the other participants rallied when I spelled “synagogue” correctly and he said it was wrong. 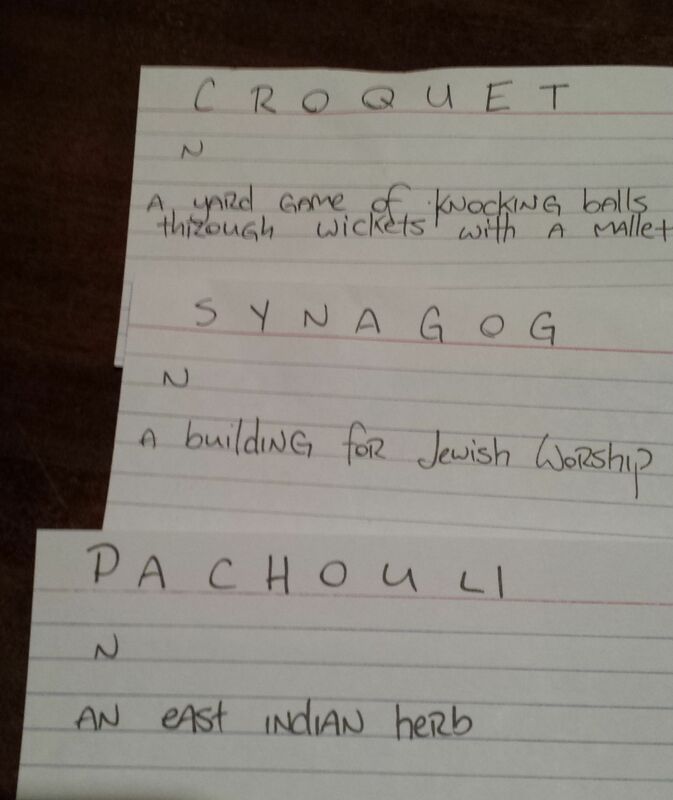 Then in the third round, I spelled “patchouli” correctly and he said it was wrong. I challenged him on that one, and quickly figured out what the problem was. His sources were a small pocket dictionary (which did not list “patchouli”) and a Scrabble dictionary, which doesn’t list words over eight letters long. He got both alternate spellings out of the Scrabble dictionary, and wasn’t aware that they were not the primary spellings. The other spellers rallied again and showed him the Merriam Webster spellings on their smart phones. By this time, you could tell that he was pissed. He mispronounced at least a couple of words too. Well, by this time it wasn’t worth it to me to be confrontational about it, but when I got the next word, “dialogue”, I was wary. So I told him that there were two accepted spellings, I wrote them both down, and counted the letters. He told me to pick one and I figured I was okay with “dialogue.” I was. On the fifth round, I blew it on “cappuccino.” Totally. He seemed pleased. The winner won on the word, “aioli.” There were a lot of foodie words. Afterwards I suggested to the host that he should not pick his words from the Scrabble dictionary for the next bee and why, but he was so annoyed with me he wouldn’t even look at me. Just kept putting his stuff away. So, even though it was great fun, I don’t think that I’ll do it again. I just can’t let spelling and pronunciation errors go in a SPELLING bee. But it was much easier to do a bee when buzzed.